All content collected from various sources on the net and rearranged. Contact blog author for any copyright complaints. Set in 1950s Kolkata, then Calcutta, Chowringhee is a sprawling saga of the intimate lives of managers, employees and guests at one of Calcutta’s largest hotels, the Shahjahan. Shankar, the newest recruit, recounts the stories of several people whose lives come together in the suites, restaurants, bar and backrooms of the hotel. As both observer and participant in the events, he inadvertently peels off the layers of everyday existence to expose the seamy underbelly of unfulfilled desires, broken dreams, callous manipulation and unbidden tragedy. What unfolds is not just the story of individual lives but also the incredible chronicle of a metropolis. 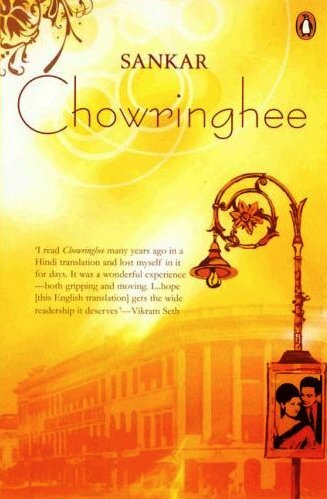 Written by best-selling Bengali author Sankar, Chowringhee was published as a novel in 1962. Predating Arthur Hailey's Hotel by three years, it became an instant hit, spawning translations in major Indian languages, a film and a play. Its larger-than-life characters—the enigmatic manager Marco Polo, the debonair receptionist Sata Bose, the tragic hostess Karabi Guha, among others—soon attained cult status. With its thinly veiled accounts of the private lives of real-life celebrities, and its sympathetic narrative seamlessly weaving the past and the present, it immediately established itself as a popular classic. Available for the first time in English, Chowringhee is as much a dirge as it is a homage to a city and its people. The novel, translated into English by Arunava Sinha, won the Vodafone Crossword Book Award 2007 for the best translation. For Bengali original, see here. Thanks a lot for the review. I have a request. The above link to download the file is not working. Can you please provide an alternate link?